This reliable small compact unit is suitable for numerous applications including Chainsaw/Trail Bike/Forestry. 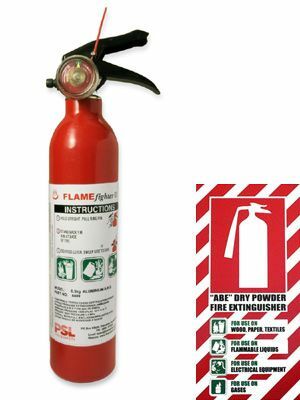 To be used on Class A Fires - Wood, Paper and Plastics, Class B Fires - Flammable Liquids, Class C Fires - Flammable Gases and Class E Fires - Energised Electrical Equipment. Also available is the durable fully enclosed belt pouch for on hand use (see below). Steel cylinder powder coated red with large easy to use handles. Powder content is Mono-Ammonium Phosphate ABE type (85% MAP content).